So you’ve made the decision to get a new oral piercing. You’ve determined its location, picked out the jewelry, and braved the procedure. Now what? 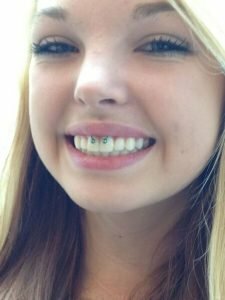 Most people who get pierced understand the level of care required after any piercing, but those located in and around the mouth demand a little more attention. Though healing time can vary from person to person, there are specific measures that should be followed for six to twelve months or longer until the piercing is fully healed. 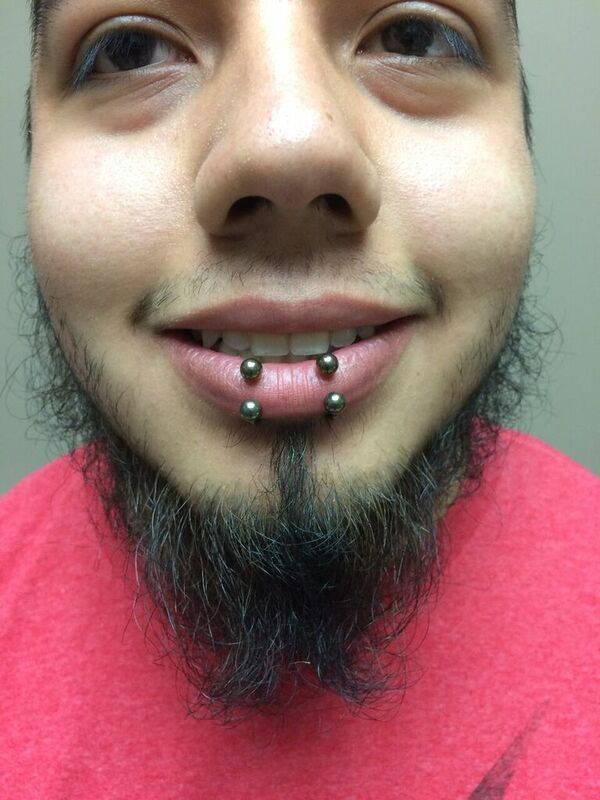 There are three types of aftercare that we recommend for new oral piercings. ‘Swish It!’ mouth rinse. Our mouth rinse is specially formulated for healing piercings. It is alcohol free and antibacterial. Use a couple capfuls (or enough to get a comfortable and complete saturation of the area) and swish with it for about 30 seconds. Make sure to swish around the piercing site to flush the area. Use 2-3 times per day for best results. We don’t suggest using ordinary mouthwash. Most brands contain alcohol or other ingredients that produce a burning feeling. These ingredients can irritate your new piercing and hinder the healing process. Non Iodized Sea Salt. This product can be used two different ways for the first 6-8 weeks. Soaking method. If you have an oral piercing with one side of the jewelry on the outside of your face, and one side inside your mouth, such as a Monroe, cheek, or lip piercing, dissolve 1/4 teaspoon sea salt in 1 cup of warm water. Mix your solution in a disposable cup, using water that is warm enough to dissolve the salt, but not so warm it burns your skin. Once you get the solution mixed, transfer some solution to an appropriate sized cup if needed to do your soak. For instance, you can transfer into a small cup, shot glass, or even a soaker bottle for hard to reach places. Soak the side of your piercing on the outside surface of your face for 3-5 minutes twice daily. You can also mix the solution (¼ teaspoon of salt to 1 cup water) and transfer into a water bottle to bring with you throughout the day. Keep your water bottle in the refrigerator. After you eat, drink anything besides bottled water, or smoke, be sure to swish with your mix of salt and water for about 30 seconds. These rinses will help keep your mouth free of large particles of food, and sooth your new piercing. It can help calm the itching part of the healing phase. The cold rinse feels wonderful on a healing piercing. Glycerin Soap. If you have an oral piercing with one side of the jewelry on the outside of your face, and one side inside your mouth, such as a Monroe, cheek, or lip piercing, You will also use glycerin soap to keep your jewelry and skin clean and moisturized. Our glycerin soap is free of animal products, dyes, and fragrances. It’s cruelty free (the glycerin in the soap is always from vegetable sources), biodegradable, and doesn’t have any added fragrance or color. To use, work up some lather in your hands, and use the lather to gently wash around your piercing. You won’t use this product inside your mouth. Glycerin soap also works great to remove makeup, face wash residues, and drainage from lip, monroe, cheek, and labret piercings. If you use acne medication, be careful to avoid getting it on your jewelry, or directly on the piercing wound. Don’t touch your piercing unless your hands are clean and you’re washing or soaking your piercing. Don’t use petroleum based ointments, full strength rubbing alcohol, or first aid products on your healing piercing. These substances can irritate a new piercing, and using them may slow the healing process significantly. 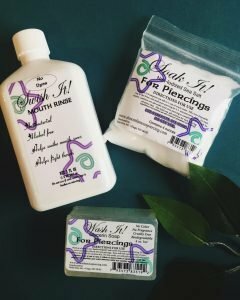 Remember, you aren’t trying to kill your piercing, just keep it clean. Don’t stop your after-care regimen until your piercing has fully healed. Do not judge the healing process upon how the piercing looks. Jewelry style, type, and gauge depend on the placement of your piercing. Your piercer will be able to advise what’s best based on personal preferences, skin sensitivities, and location. Avoid any sexual activities involving the mouth during the healing process and any rough activity that may pull on your piercing, or cause you to bite down on the jewelry or the newly pierced area. Intense friction and pulling on a fresh piercing is a common way to trigger migration, a process in which the body “pushes” the jewelry out of the body. Check your jewelry often to make sure the screw-on ends remain tightened. You should make it a habit to do this each time you clean your piercing and before you go to bed at night. Remember: tighten all threaded accessories by turning them to the right – righty, tighty. We make sure your beads are secure when you leave the store, but it is not a guarantee they will stay on your jewelry forever. Return to Almost Famous Body Piercing to downsize your jewelry once swelling has decreased. We will help you find the right fit, and assist you in changing out your jewelry. Try to eat very slowly. Place only small portions of food in your mouth at a time. Stick to cold foods and drinks to soothe and reduce swelling in the first few days. Avoid icing your piercing. Cold drinks from the refrigerator are cold enough. If you experience bleeding or swelling, do not drink alcohol or caffeine as they may exacerbate symptoms. No gum! Chewing gum harbors bacteria in the mouth. Be careful with sticky foods (like mashed potatoes) that may irritate the piercing. Soft isn’t always safe. While eating, try not to open your mouth too wide or move your tongue excessively to avoid contact between your piercing and teeth. Opt for liquid meals like meal-replacement drinks, green smoothies, and protein shakes. Avoid hot and spicy foods – choose cold foods instead like yogurt, applesauce, or ice cream. Always remember, a piercing is a wound!! Treat all piercings like you would any other injury. Protect the area, keep it clean, and allow it to heal before changing out the jewelry. 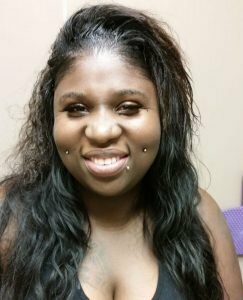 At Almost Famous Body Piercing, we know it may be inconvenient at times, but meticulous attention to your oral piercing when first getting it will pay off in the long run. Minimize your risk of infection and rejection by cleaning your piercing thoroughly and often. Eat a healthy diet that follows the aforementioned guidelines, get plenty of rest and decrease your stress levels as much as possible. Soon, your after-care regimen will be complete and you’ll have a healthy, beautiful piercing you will enjoy for years to come.